– 1 in 10 women of reproductive age in the UK suffer from endometriosis – that’s approximately 1.5 million women. This figure is comparable to the number of women living with diabetes in the UK. – It is thought 176 million women worldwide are living with the condition. – Endometriosis costs the UK approximately £8.2 billion a year in treatment, loss of earnings and healthcare. 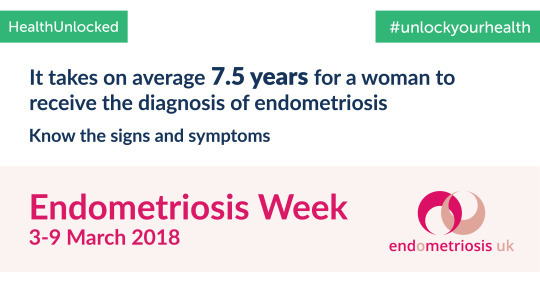 This week is Endometriosis Week, which aims to raise awareness about this hidden and often unrecognised condition. Endometriosis is a condition where cells like the ones in the lining of the womb (uterus) are found elsewhere in the body. Each month these cells react in the same way to those in the womb, building up and then breaking down and bleeding. Unlike the cells in the womb that leave the body as a period, this blood has no way to escape. It is a chronic and debilitating condition that causes painful and/or heavy periods. It may also lead to infertility, fatigue and bowel and bladder problems. Endometriosis can have a detrimental impact on a woman’s quality of life, having repercussions not only with their health but with education, work and personal relationships. If there was one piece of information we could open the door on, it would be to find out what the cause of endometriosis is. This information would serve to inform research into means of treating the condition. Although there are different theories about the cause of endometriosis, there is not a known definitive cause. There is currently no cure for the condition and diagnosis and treatment can be complex. The ‘gold standard’ for diagnosing endometriosis is by laparoscopic surgery. It takes on average 7.5 years for a woman to receive the diagnosis of endometriosis. Women are often told that the pain they are experiencing is ‘normal’ or ‘all in your head’. This can cause psychological distress for women as they continue to experience debilitating symptoms with no answers to the cause. “I first experienced severe gynaecological pain when I was only 12, before I’d even started my periods. This crippling pain continued to visit me every month for a whole year until I eventually started my periods. Once I started my periods, the pain got even worse. It reached the point where I experienced it every day of the month and was rushed into A&E twice monthly (once during my period and once during ovulation) and would often be given morphine as pain relief. I kept being told it was ‘normal teenage cramps’. I also lost a lot of blood, easily using up to 12 tampons and pads an hour. Due to the amount of blood lost, I became anaemic and suffered from chronic fatigue. “I was 14 and my quality of life was non-existent; I could no longer go to school because of the pain, chronic fatigue, and being in and out of hospital all the time. I finally had a laparoscopy in 2010 and was diagnosed with endometriosis. I cried with happiness when I was diagnosed with endometriosis because it meant my symptoms were no longer ‘phantom’ pains but actually a real condition! You can get support and speak with other people who also have endometriosis from across the world in the Endometriosis UK HealthUnlocked community. Endometriosis UK is a charity which provides vital support services, reliable information and a community for those affected by endometriosis. Previous Entry What on earth are comorbidities?